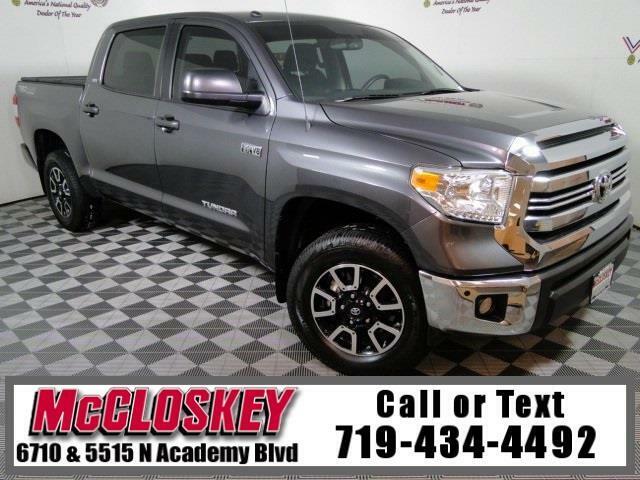 Powerful 2017 Toyota Tundra SR5 CrewMax 4x4 with TRD Off-Road Package, Keyless Entry, Bluetooth Wireless, Backup Camera, and 5.7L V8 Engine! Going with the SR5 gets you foglights, variable intermittent windshield wipers, exterior chrome trim, 60/40-split folding rear seats and an upgraded tech interface that includes a 7-inch touchscreen, HD and satellite radio, traffic information and a navigation app. The crew cab adds a power-opening rear window and an overhead console. The SR5 Upgrade package adds front bucket seats that include a driver seat with power height and lumbar adjustments, a center console (with storage and "floor" shifter), a tilt-and-telescoping steering wheel, an auto-dimming rearview mirror, and a larger gas tank when equipped with the 5.7-liter V8. This vehicle passed our 110 multi-point inspection and is backed by our National Quality Dealer of the Year Award. We are an ''A+'' Better Business Bureau Rated Business. We offer low interest rate financing, low down payments and the highest trade allowances in the state! Here at McCloskey we do things a bit differently, we shop our competition every day to ensure a great value to you. Come on down and experience it for yourself. This McCloskey Assured vehicle includes a 2 month/2000 mile Warranty and a Vehicle History Report!! At McCloskey we strive to provide ASSURANCE, TRUST, VALUE AND QUALITY! Call 719-434-4492.